You are browsing the Blog for Near the Clock Tower. 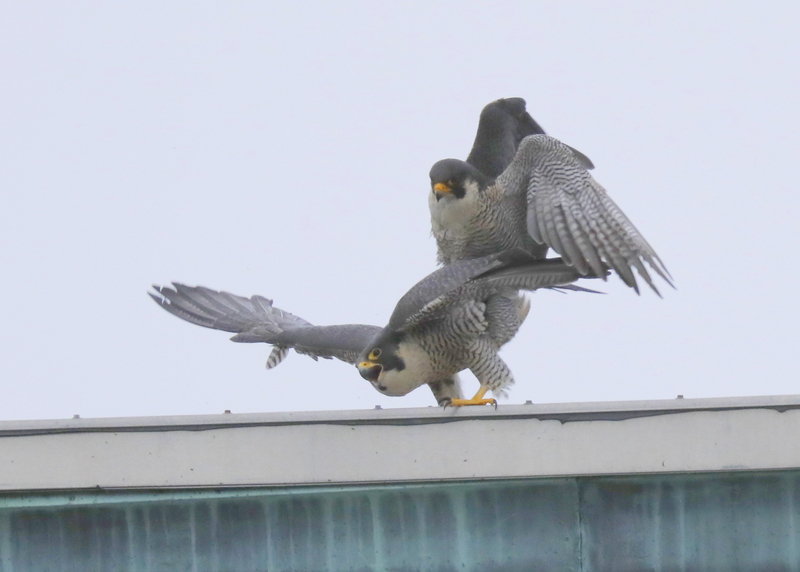 Lawrence Peregrines: very sad news….”Crash” has passed away.. 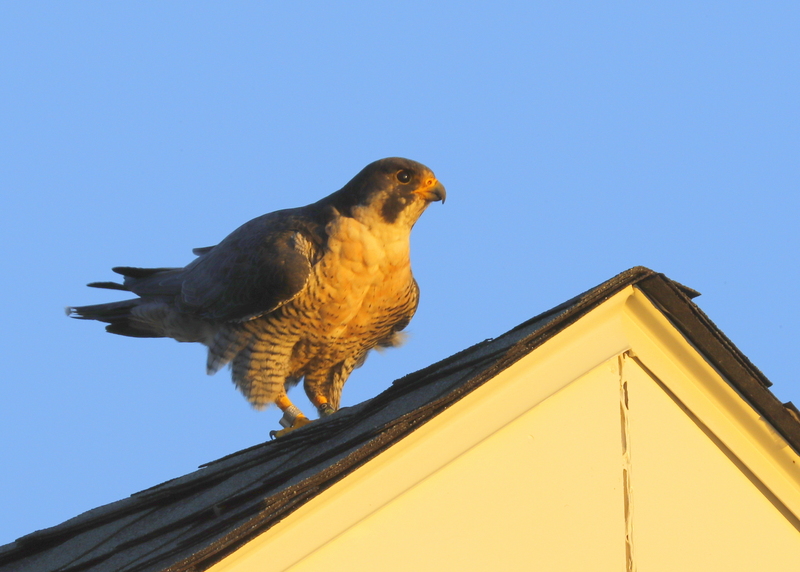 I just learned from the Tufts Wildlife Clinic that the 17 year old male Peregrine Falcon, 6*/4* from Lawrence just died. This is not a surprise, but it is the end of a long and impressive legacy. I will pull together a brief summary of his legacy soon. Made a pass by the Ayer Mill Clock Tower while heading to Industrial Way to observe the winter crow roost. Skies were overcast, winds were E at 7MPH, and temps in mid-forties. The male was in the nest box and then hopped out onto the wooden perch pole. 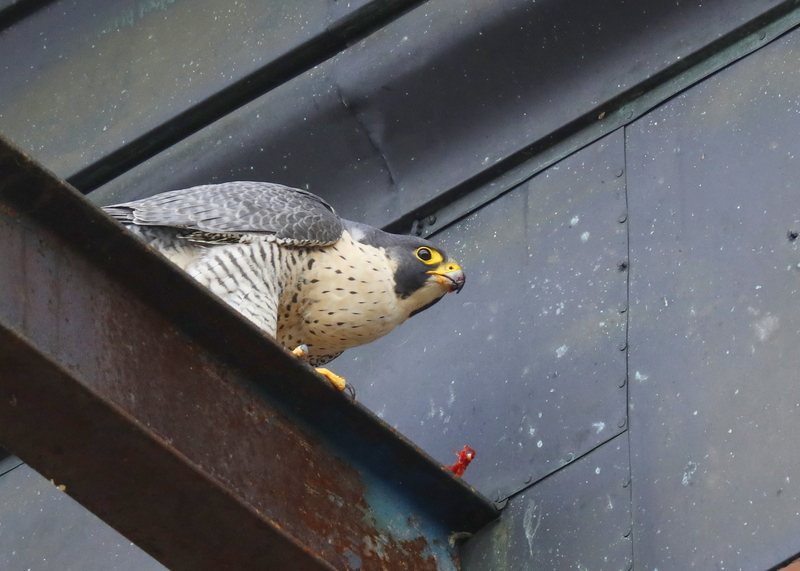 The female arrived and landed on the SW corner of the New Balance building at 200 Merrimack Street. She cleaned her bill and then made a few soft calls to the nearby male. He swooped off of the perch pole and landed atop the female with talons carefully tucked in. During copulation the female is pitched forward,making an angle of about 45 degrees with respect to the perch The copulation wail is given throughout. As the male mounts,the female spreads her wings out at the elbow about one-fourth open. The tail, up and to the side, may be partly spread. The male flaps his wings throughout copulation, maintaining an upright posture with the neck extended and bent in a curve. Usually the male gives one or two bursts of the Chitter vocalization just before,during,and/or just after mounting and then Eechips sporadically. Some individuals give bursts of Chitter throughout. Toward the end of copulation the male stops his tail movements pressing his cloaca against the female’s. Rapid wing-beats accompany this tail-press. The female may spread her tail partly at this time,and the male departs with a Hitched-Wing Display directly afterwards. Wrege, P. H. and T. J. Cade. 1977. Courtship behavior of large falcons in captivity. Raptor Res. no. 11:1-46. 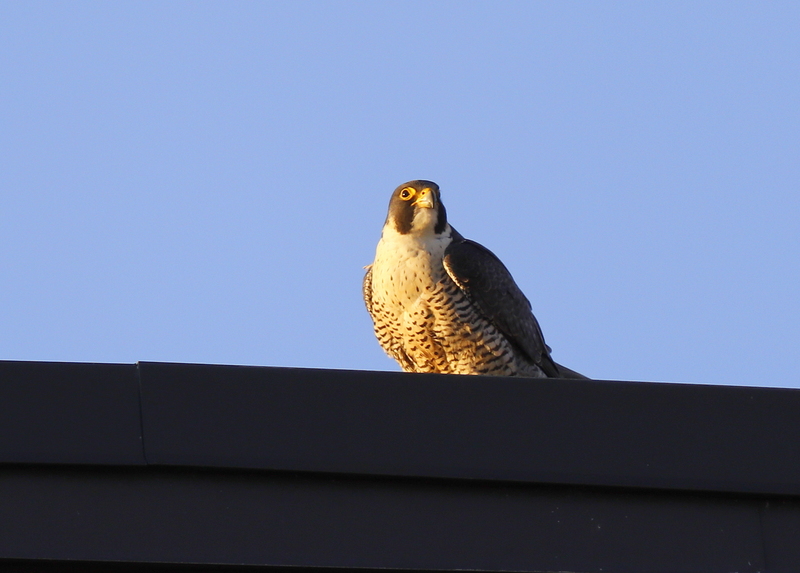 Arrived in the Clock Tower area close to 6:15 pm and located both peregrines on the south edge of the New Balance building along Merrimack Street. The male sat quietly without moving much. The female was closer to the SW corner and she was cleaning her bill against the edge of the roof line! 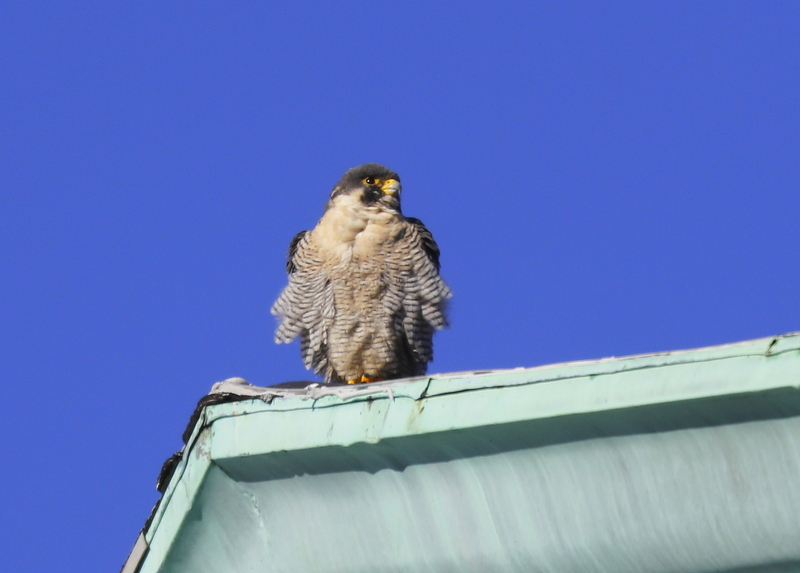 Under clear skies, bright sun, strong NW winds at 17MPH, gusting 23MPH, and temp around 18F, with wind chill at 3F, made a short visit to look for Peregrine Falcons at Boston University. 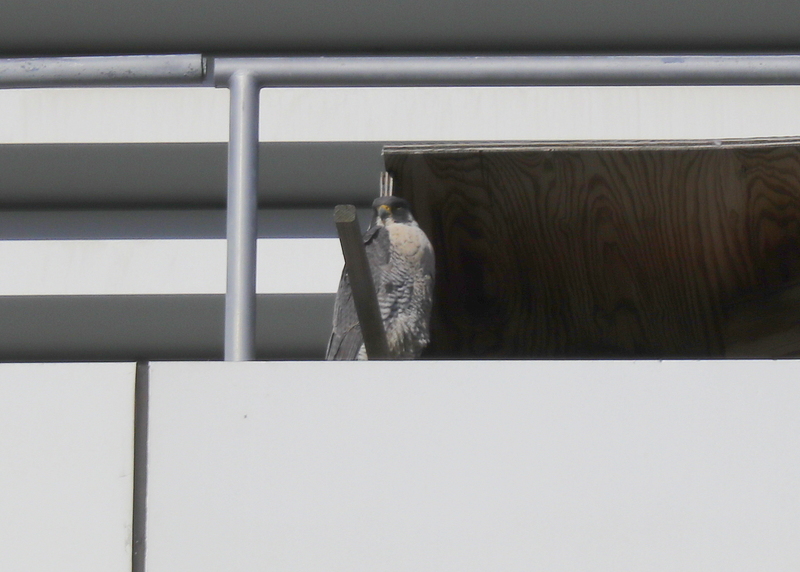 Located one falcon next to the entry to the nest box atop the 26 story Stu Vi II high rise student dorms. 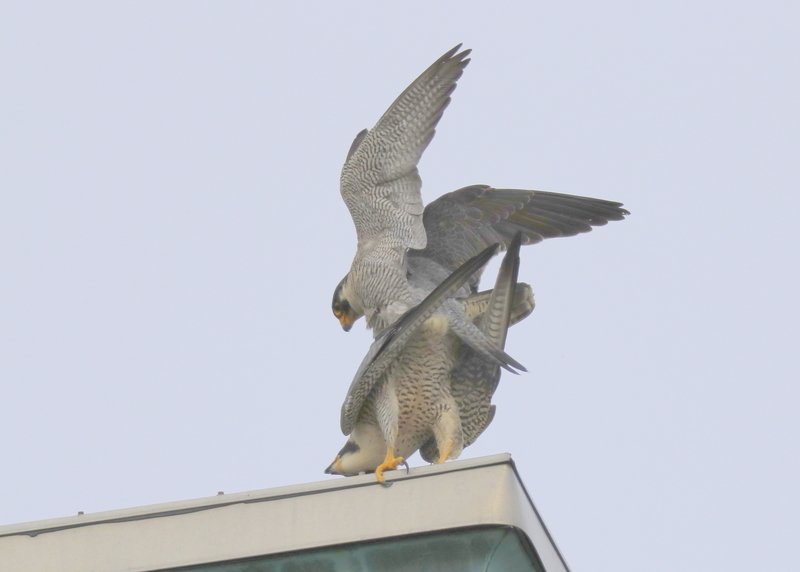 Lawrence Peregrines: pair bonding underway! Made a morning run by the Clock Tower in search of the Lawrence Peregrines. Mostly cloudy, wind from NW at 9MPH, and temp around 42F. 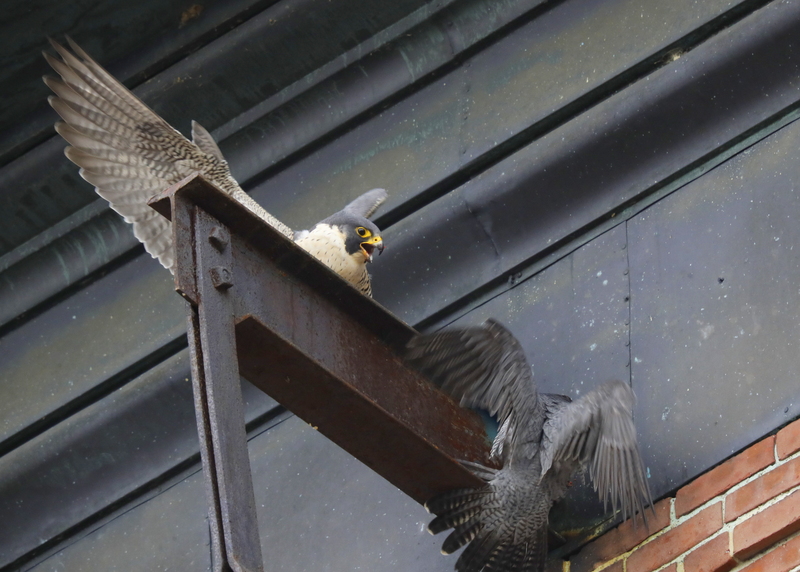 The female was perched on the short but prominent steel beam on south side of Merrimack Street near intersection with Union Street. This is a very regular perch location in the morning, as the weather warms up. She was midway through a morning snack, when the male zoomed in and snatched the goodies….pair bonding underway! 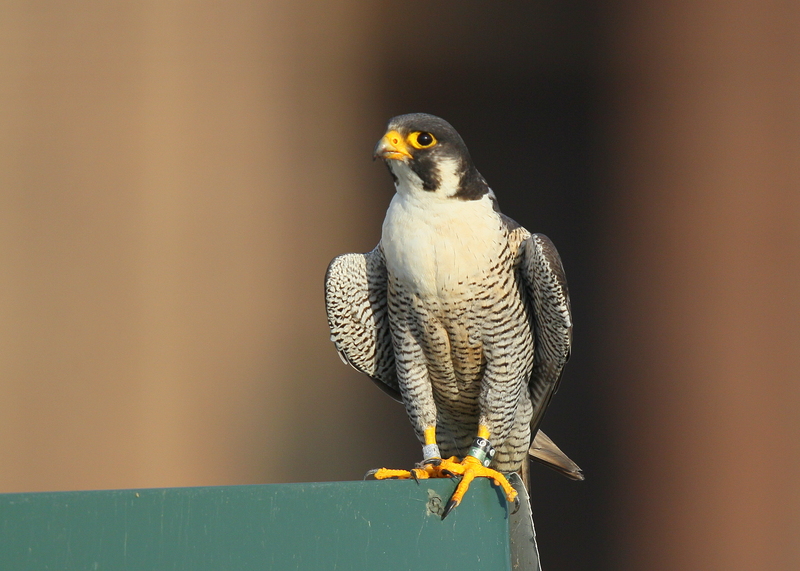 The Lawrence Peregrines continue to loaf and enjoy the cooler fall days around the extended Clock Tower area. Located the adult male this morning on one of the triangular roof pediments. The morning was filled with bright sun, cobalt blue skies, light wind from the SE, and temps just over 50F. The male looked a bit bedraggled with feathers blowing in the wind. The female was nearby on the wets side of Clock Tower on a ledge above the clock face. 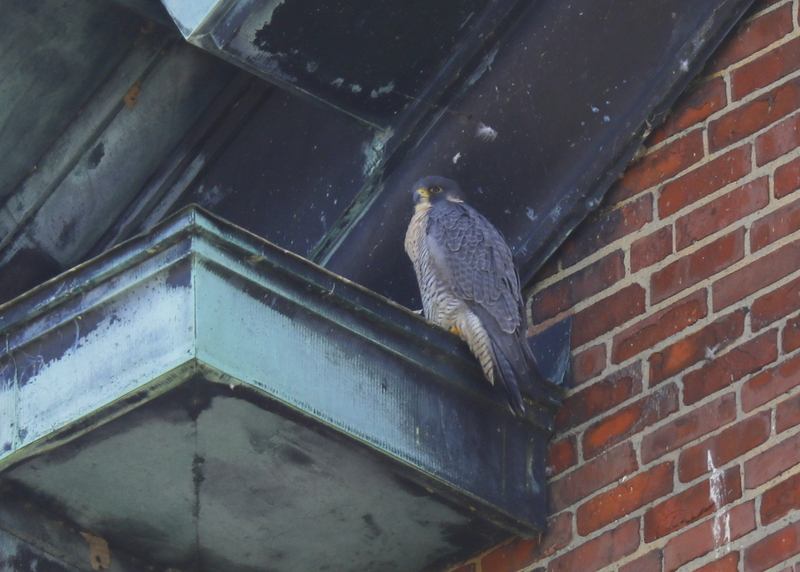 Made a late afternoon pass by the Ayer Mill Clock Tower for a brief look at the peregrine falcons. While scanning for the peregrines, noticed hundreds of American crows streaming into the area west of the New Balance building complex and preparing for their overnight winter roost. In the midst of the crow chaos, noticed a single peregrine buzzing a few of the crows. 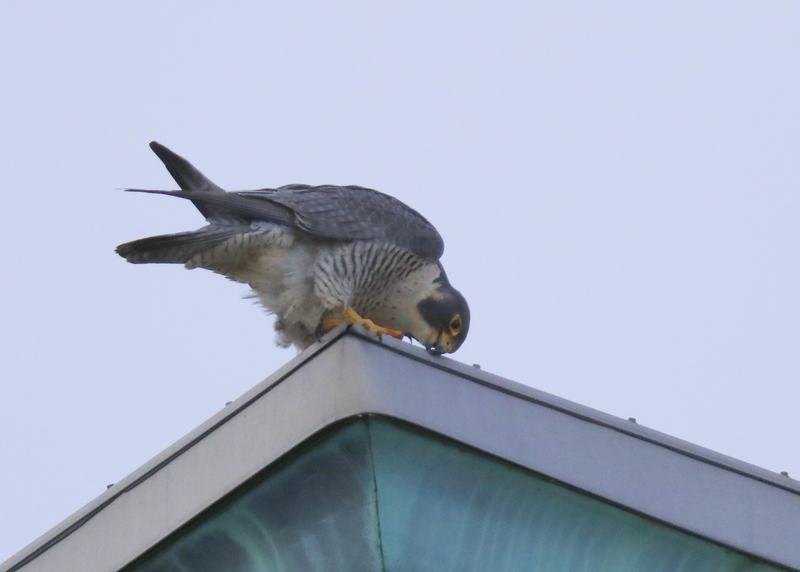 The peregrine landed on a number of lower than normal rooftop perch locations, perhaps to take a run at some of the crows. As it perched atop the roof of B&D Advanced Warehousing Corp. building in fading sunlight. As it moved around just a bit while perched, the bi-colored alpha-numeric leg bands were exposed. It was the male with the black over green 6/4 left leg band! Chicks are helpless fuzz balls! 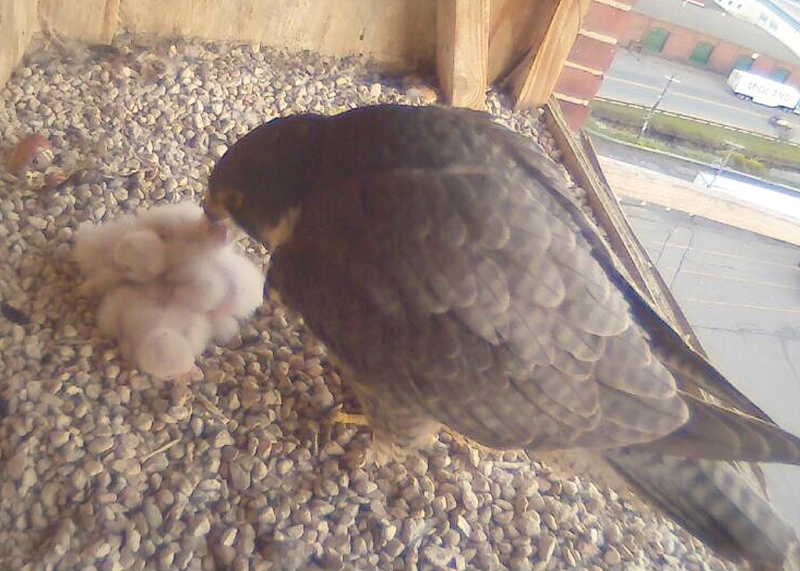 Peregrine Falcon chicks are helpless. One parent (often the female but sometimes the male) stays with the chicks while the other finds food for the brood. Eyases eat an incredible amount of food – but then, they double their weight in only six days and at three weeks will be ten times birth size. Newly hatched chicks are wet and covered with white down. But by three weeks of age, brownish juvenile feathers can be seen poking through the white fuzz. By five or six weeks of age, the white fuzz has been completely replaced by brown feathers. The eyases can be observed jumping around and testing their wings, getting ready to fly. Mating starts as many as four weeks, or more, before egg laying and continues through the process, up to several times an hour. The male will mount the female, typically no longer then ten seconds, then he will disengage and fly off. Fertilization of an egg happens every 48 hours. After being fertilized, it takes an egg 24 hours to develop and be laid… resulting in a new egg being laid every 48 hours! We are likely a day or two away from the first egg being laid, if it hasn’t happened all ready!